At SciChart we focus on providing high-performance chart components. Our software is field tested by Formula 1, Oil & Gas, Process Control, Aerospace, Defence & Medical companies around the world. Before SciChart was created, most chart components focused on generic charts for business and sales dashboard applications and neglected the speed, performance & features required by the scientific & engineering communities. SciChart provides a High Performance, Realtime, Feature-rich Chart Component built for developers of scientific, medical & engineering applications on Windows (WPF), and mobile (iOS/Android and Xamarin). Get started right away creating your first scientific app using SciCharts Powerful Charts. These features make SciChart the Perfect Choice for demanding scientific & medical applications requiring high-performance, real-time charts on the Windows and Mobile platforms. SciChart is built for real-time scientific applications. This demo shows how to create a spectrogram on all our platforms. Available for iOS, Android and WPF. SciChart is perfect for real-time medical monitoring applications. 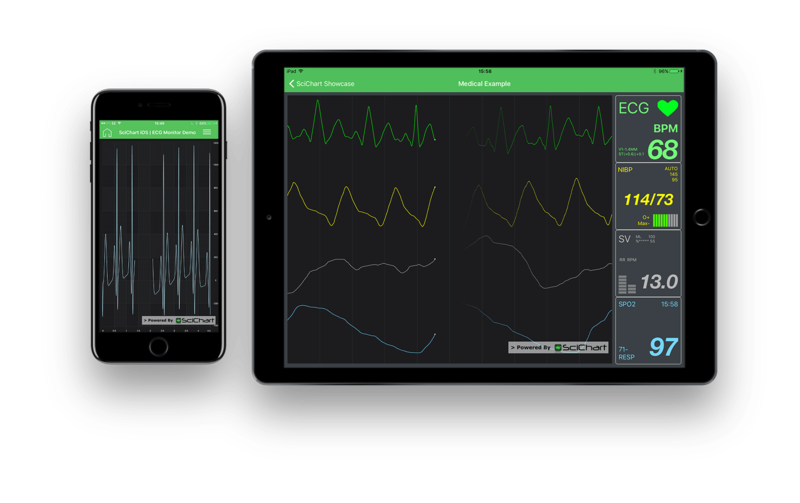 This demo shows how to create an ECG monitor on all our platforms. Available for iOS, Android and WPF. The University of Illinois departments of Bioengineering, Mechanical Science & Electrical Computer Engineering were researching alternatives to FT-IR for use in Medical Diagnostics. 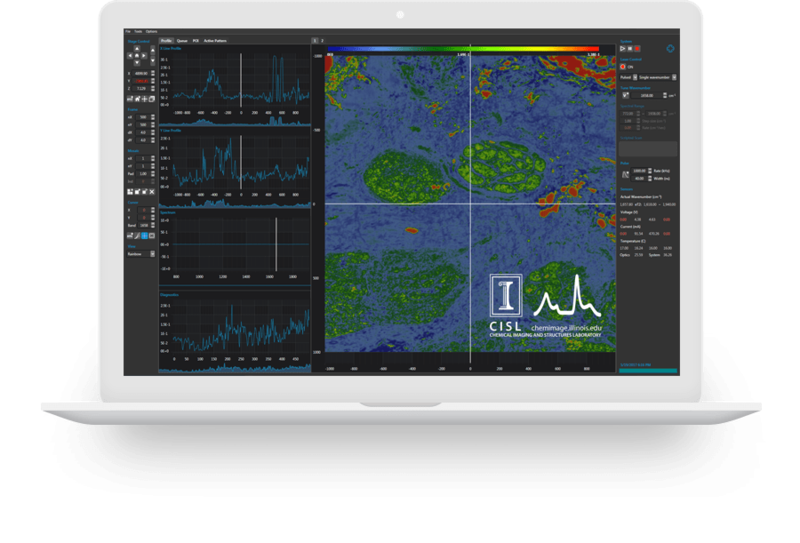 With their innovative Quantum Cascade Laser set up, they generated up to 100 million data points in real time and displayed them with SciChart's Heatmap type. The Laser Multispectral Diagnostic Analysis and Sensor Technology research group operating out of the Optics & Optoelectronics laboratory was seeking to improve marine exploration technology with a focus on the spectroscopic abilities of portable USB spectrometers. Previously limited by the charting capabilities they turned to SciChart to reinvigorate the sector. With SciChart you can build a wide variety of Scientific Applications that require fast, relatime or big-data charts. Using our example suites you can get started right away by customizing one of our samples. With fast, real-time charts, SciChart allows you to build Oscilloscopes and spectrum analyzers. With the ability to link multiple charts, or have many traces on one chart control, plus smooth realtime updates, SciChart is perfect for ECG / EKG applications. Our charts are used in healthcare applications across platforms, as well as instrumentation and test devices for the medical industry. With the ability to rotate charts vertically (XAxis on the left, YAxis on the bottom), SciChart is used in the oil & gas industry to provide drill depth profiles. Annotate the chart with our annotations API, draw custom markers, custom series to visualize the complex data captured by oil well drills. With high performance real-time charting you can build visualization for all kinds of sensors. Zoom and pan your data to drill into it, show tooltips and more. Areas of interest can be highlighted with annotations, markers or labels. Custom visualizations can be created by using our powerful APIs. // What do customers say about SciChart in Scientific Applications? In a recent campaign to solicit reviews from our customers, we were blown away by the magnitude of the response from customers giving us 5-star ratings. Many of the reviews and testimonials mentioned using SciChart in Engineering and Scientific applications. I have started using WPF Scichart for a scientific research application. It has made my life so much easier. I can keep all my data visualisation within .net and not have to introduce a whole new environment with all the associated difficulties. I have compared a few scientific plotting software packages. Eventually, I selected SciChart WPF package for our software development. SciChart is very flexible and has a great support from their developers if needed. I think it is the best WPF plotting package we ever used. Definitely would recommend it. The WPF Scichart component has been deployed as part an oscilloscope for a AC Motor Controller. It has transformed the commissioning and fault finding capabilities and has been very well received by many customers. There's more! Have a look at the case studies below where customers of SciChart WPF, iOS and Android have used our high performance charting libraries to create incredible scientific apps using our big-data and real-time charting. IMT AG’s custom hardware project, the Citrex H5 had a range of hardware and cost requirements. SciChart was able to work with these and get IMT’s Gas Flow Analyzer off the ground with custom features and a slick high-performance interface despite the hardware limitations. Cardea Labs were trying to build a low cost portable ECG device with medical grade clarity using their bespoke hardware the miBEAT. To achieve this they needed a dynamically updating chart at 250 points per second. SciChart’s extensive charting examples made this simple, allowing them to create the custom FIFO ECG chart they needed. Click below to see all the extra features SciChart was able to integrate. SciChart is licensed per developer on a perpetual basis, with no hidden fees or costs after purchase! You are free to redistribute your scientific and medical applications you create with SciChart worldwide without royalties or further licensing fees. We offer technical support for our chart controls built into the purchase price so you can be sure we'll help you every step of the way. To find out more about our Cross-Platform Realtime Chart components contact us below to ask Sales a question.